Show off your hives or document them before they decide to go for a walk. 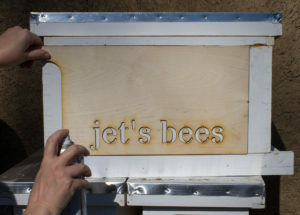 These stencils are for Langstroth beehives, laser cut from 1/4″ Baltic birch plywood. The dimensions, not including the handle, are 16 1/4″ wide and 9 1/2″, and fit the rear of a Langstroth hive. You can hold the stencil against the hive with one hand and spray paint with the other, it takes only a few seconds to paint a hive. We have a variety of fonts available, for an extra charge can customize your logo in to a stencil or help you design a new one. If you’re left-handed, I can move the handle to right hand side, a hole for hanging in on a pegboard is also free. You’ll get an image in email showing how the stencil will look before we cut the stencil. Here’s a PDF with all the available stencil fonts.